Entice birds to your yard with the beauty of the Heartwood Copper Songbird House. This charming, mahogany house has a deep brown colored exterior, perfectly complementing the copper roof. A delicate braid adorns the bottom edge of the roof, adding beautiful detail to this abode. A decorative 3" copper perch leads songbirds into this house, where they can easily set up residence. The copper roof will eventually age to a lovely patina, adding even more elegance to the item. Hang this unit by the 1.5" diameter ring at the top of the roof, or incorporate it into your home décor. 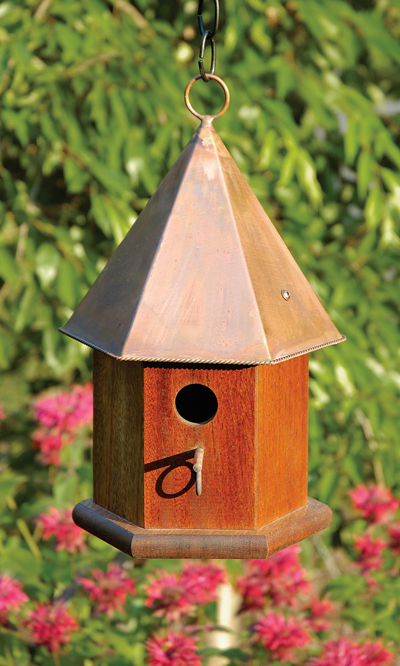 Create a dramatic rest for birds with this Copper Songbird House. Made in the USA.